Served as the owner of their family business for 64 years from 1596 till 1661, aged 21 -85. Born in Settukoku Nishinarigun, now known as Higashi-yodogawa-ku, Osaka, in 1576, which was during the Warring Period. Started the business around 1596. In the early stages of business, he worked with Bigo Fukuyama Osakaya Kujuro and made a fortune with their mine development business in the Chugoku district. At the request of Ushimaru, a vassal of Satake, he started to develop copper mine in Akita in 1602 or 1603. Satake was transferred to Akita in 1602, and Tokugawa Ieyasu opened the Edo Government in 1603. During the Hoei period, Akita’s Ani enjoyed the nation’s No.1 position in copper output, and in its peak time, it produced copper of 3.6 million kin a year, which was equivalent with rice of 700,000 koku in its value. In 1603, he built a house in Osaka kitasumiyacho, now known as Nishishinsaibashi, Chuo-ku, Osaka, where he started to smelt copper. Dobuki(copper smelting) and Nanbanbuki (to extract silver from copper by means of lead) were “state-of-the-art” industries at that time. The historical record shows that he had also started trade with foreign countries by 1631. Ⅰ Kuzaemon expanded his business field aggressively, ranging from copper mine management, copper smelting and distribution, to export of copper to foreign countries. By his strong control of all the businesses, he accumulated huge amount of profits and founded Osakaya. His name, Osakaya Kuzaemon, was taken as a hereditary title, followed by his 8 successors, lasting 270 years towards the end of the Edo government. Ⅰ Kuzaemon had close connections with Bigo Fukuyama, now known as Fukuyama shi, Hiroshima, and Bigo Fukuyama Osakaya, managed by one of his relatives, developed copper mine in Shinjo Hongo and became prosperous when Mizuno Katsunari was the daimyo of Fukuyama domain. His wife, Karu, was a daughter of Bigo Fukuyama Fujii Anuemon. Kuzaemon’s elder daughter Tora, at the age of 4, married then 21-years-old Kusaburo, the elder son of Bigo Fukuyama Osakaya Kujuro. Through this marriage, Kusaburo was appointed Kuzaemon’s business successor. Kuzaemon passed away on July 15, 1668 in Tsuruga, Esshu at 92. His grave is placed at Isshinji temple located in Osaka Tennojimura, now called Osaka Tennojiku Osaka, and at Chingoin of Zenmyoji temple, located in Tsuruga, now Tsuga-shi of Fukui. In 1967, a memorial service was held on the 300th anniversary of his death. Daimonjiya, a kimono store now known as Shinsaibashi Daimaru Department Store, located in the east side of Osakaya’s main residence. Served as the owner of Osakaya for 21 years, from 1661 till 1682, aged 21-42. Born in 1641, and formerly called Kusaburo. In 1661, he took over the Osakaya business and became Osakaya Ⅱ Kuzaemon. In 1670, he told Shichirouemon, a tedai at Osakaya, to investigate Sanmaisan, Ani, Akita. In the same year, Shichirouemon found copper mine in Sanmaisan, which incident eventually led to their total control of 11 mountains in Ani, Akita. Afterwards, Ani copper mine topped the nation’s copper output. 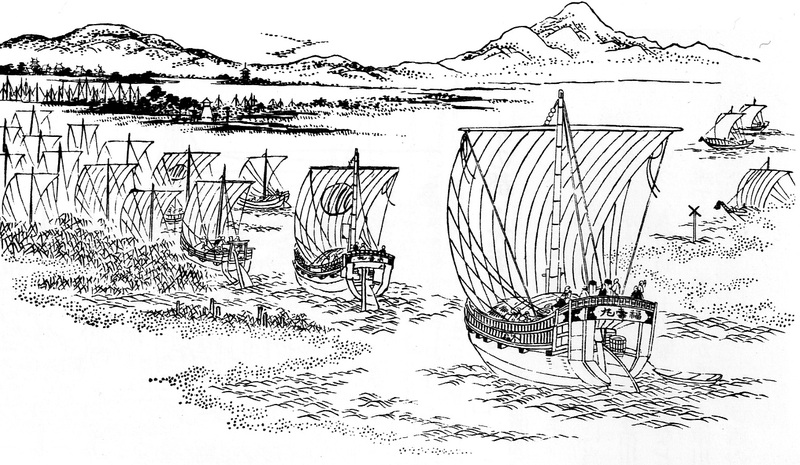 Copper ores yielded in Ani, were shipped along Yoneshiro River by boat, and put into Kitamaebune(big ship) at Noshiro port and then unloaded at Echizenkoku Tsuruga, now called Tsuruga-shi, Fukui. They were shipped by boat again to Osakaya, going south along Lake Biwa. In return, daily goods of urban lifestyle were introduced to wealthy people in Akita. Among others, expensive “akamikageishi” (red granite), which was unique to Kyoto area, was highly valued in Akita, and it is still used for gravestones or stone lanterns as cultural assets. Copper ores, yielded in Ani, Akita, contained lot of silver, and Osakaya made a huge profit by extracting silver by nanbanbuki method. Nanbanbuki was then state-of-the-art technique which was to extract silver from copper by means of lead, and since Osakaya possessed the exclusive rights to develop lead mine in Akita domain, they presumably obtained a huge volume of silver. In 1678, “do-boeki-kabu”(exclusive permit issued by government to trade copper) was issued for Osakaya Ⅱ Kuzaemon, as one of the 16 permit holders, called “jurokunin kabunakama”, and obtained the No.2 position after Sumitomo. < Dobuki-yuraisho >(book which states the origin of copper smelting industry) In 1682, Ⅱ Kuzaemon retired and transferred his control of Osakaya business to Nagamatsu, the youngest child of his predecessor. Ⅱ Kuzaemon started a money exchange house in Sumiyacho, Osaka, and took up the new title of Osakaya Ⅰ Kuuemon, starting a branch family. He passed away on September 10, 1707 in Tsuruga, at 67. Served as the owner of Osakaya for 33 years from 1682 till 1715, aged 17-50. Born in 1666 as the second son of the founder Kuzaemon , who was 90 years old. Formerly called Nagamatsu, and in 1682, he took over the Osakaya business from his predecessor at 17 and became Osakaya Ⅲ Kuzaemon. During his tenure, Akita Ani copper mine especially played a crucial role. Although Akita copper mines were first controlled by Osakaya, Sumitomo, Konoike and Kitakuniya, Osakaya obtained the exclusive rights to manage all the copper mines in Akita in 1697. Restoring Akita’s declining copper mine business as well as loaning silver of 2014 kan, which was equivalent with about 40,000 ryo, to Akita domain for construction of their residence in Edo, Osakaya demonstrated their capabilities as business manager. In 1687, Osakaya fought with Sumitomo over the rights to develop Besshi copper mine. Osakaya found copper mine deposit in Mt. Besshi, adjacently located to their Shikoku Tatekawa copper mine. However, Kiriba Chobei, an employee of Osakaya, secretly passed the information to Sumitomo in 1691, and consequently the government issued Sumitomo the permit to develop the copper mine in Besshi, according to the record. This eventually caused the death of more than 100 people. < An excerpt from Osaka Mainichi Shimbun Newspaper, 1940 > Osakaya’s Akita Ani copper mine topped the nation in copper output during Genroku period, but Besshi copper mine output even exceeded this amount afterwards. In the later Genroku years, copper development business started to decline, and in 1701, Ⅲ Kuzaemon Seishun, along with Sumitomo’s Izumiya Kichizaemon submitted their opinions on copper business management, consisting of 50 some clauses, to kanjobugyo(commissioner of finance) Ogiwara Ominokami Shigehide. His wife, Man, was a daughter of Ⅱ Kuzaemon and their eldest daughter Nao married Amagasaki Matauemon VII of Osaka Tenman, and their second daughter Masa married Hiranoya Matauemon of Imahashi Icchome respectively. Ⅲ Kuzaemon Seishun passed away on September 14, 1715 in Tsuruga at 50. Served as the owner of Osakaya for 8 years from 1715 till 1723, aged 19-27. Born in 1697, and formerly called Jinnojo. He was the second son of Ⅲ Kuzaemon Seishun and took over the Osakaya business from his father in 1715 at 19. In the following year of 1716, he stared to manage Nagamatsu copper mine in Dewanokuni Shinjo domain, now called Mogami-gun, Yamagata. < Ushu Shinjoryo Nagamatsu Dozan Unjokin Shobun >(contract which promises to pay tax on Nagamatsu copper mine management to the daimyo of Ushu Shinjo domain) He also started to manage new copper mines in Iyo, Bichu, Tannba and Tajima, but the amount of copper mine deposit declined at that time, and due to the decline of cost performance, the overall profit was reduced. Therefore, in order to restore the efficiency of family business, he went through a management reform in 1719, such as tightening the discipline of employees. Ⅳ Jinnojo Seijin was appointed “dofukiya kumigashira”(representative of copper smelting industry) in Edo, Kyoto and Osaka and “gindofukiwakegoyo” (merchant who was allowed by the government to extract gold and silver from mine), in addition to “kinginfukiyagoyo” (merchant who was allowed by the government to smelt silver and copper). Also, due to his weak constitution, he was allowed to work in Edo, and exceptionally allowed to ride a horse, according to the historical record. He passed away on April 5, 1723, in Edo, due to illness. He was 27 years old. His grave is placed at Isshinji temple of Osaka Tennojimura, now called Osaka Tenjojiku Osaka, as well as at Unkouin of Edo Fukagawa, now called Koto-ku, Tokyo. His wife, Matsu, was a daughter of Igawa Zengoro, the owner of Kyoto Kichimonjiya. Served as the owner of Osakaya for a year from 1723 till 1725, aged 5-6. Born in 1719 as the eldest son of Ⅳ Jinnojo Seijin and formerly called Kichinosuke. Following the death of Ⅳ Jinnojo Seijin in 1723, Ⅴ Kichinosuke Seitatsu took over the Osakaya business at 5. As was his father, he was appointed “kingin fukiwake goyo” (merchant who was allowed by the government to extract gold and silver from mine) and “dofukiya kumigashira(representative of copper smelting industry) in Edo, Kyoto and Osaka, as well as “gindofukiya goyo”(merchant who was allowed by the government to smelt silver and copper). On July 17, 1724, the following year of the appointment, he passed away due to illness in Edo, at 6. Served as the owner of Osakaya for 46 years from 1724 till 1770, aged 4-50. Born in 1721 as the second son of Ⅳ Jinnojo Seijin and formerly called Eijiro. In 1724, he took over the Osakaya business at 4, when he was also appointed “goyo dofukiya”(merchant who was allowed by the government to smelt copper) and “do-fukiya kumigashira”(representative of copper smelting industry) in Edo, Kyoto and Osaka. In 1738, at the request of Akita domain, Osakaya resumed to manage copper mine for minting. However, as they were not able to receive profit from the domain, they ended up posting the accumulated loss of 20,000 ryo in 1745. In the following year of 1746, Osakaya sold Shikoku Tatekawa copper mine to Sumitomo and its sales were used to cover the loss in Akita. Local residents reacted emotionally towards the written request to change the management, submitted to Inagawa Yaemon bugyo(commissioner) by Osakaya and Sumotomo. Consequently a petition was submitted to Edo government. In 1748, Ⅵ Kuzaemon Chisyo dispatched Osakaya’s tedai to Shikoku and suppressed the trouble, by requesting major headmen of Saijo domain to make sure their farmers would not start a riot Akita domain wanted to extract silver from copper around 1752, using “nannbannbuki” method, use of which was under the control of the government. 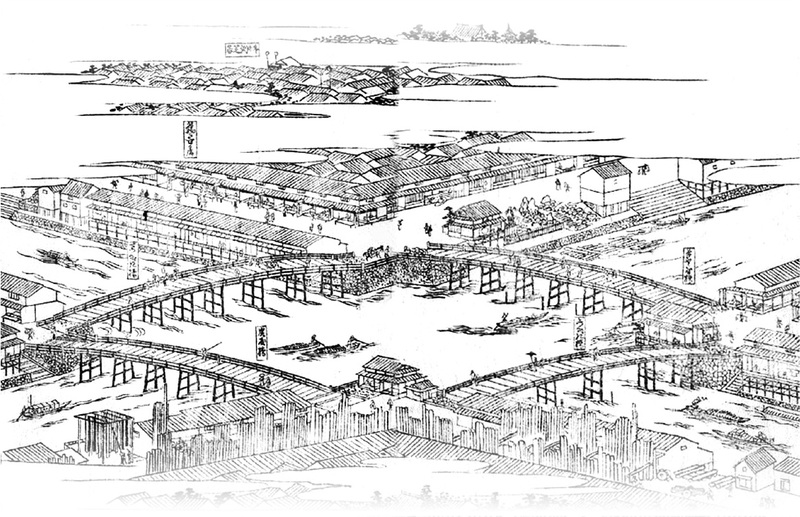 One of Osakaya’s historical articles, “Akita Kagoyama fukiya ezu” produced in 1753, is the plan of smelter in Akita Kagoyama, which is now called Futatsui-cho, Noshiro, Akita. < Akita Kagoyama fukiyaezu > Ⅵ Kuzaemon Chisyo was appointed “bakufu kaisen tosiyori onyaku”(shipping councilor for the government) in later years, and during Genbun years, he received the equal status as “machikata soutoshiyori”(Osaka city administrator) from Osaka-machibugyo (Osaka city commissioner) Sasaki minonokami. In 1750, he was appointed “Akita ondo shihaiyaku”(copper industry advisor for Akita domain) by Satake Udaifu, the daimyo of Akita domain. He passed away on July 5, 1770 at 50. His wife, Kii, was a daughter of Osakaya Kuzaemon Seishun, who was from Osakaya’s branch family. Served as the owner of Osakaya for 14 years from 1770 till 1784, aged 24-38. Born in 1747, as the eldest son of Ⅵ Kuzaemon Chisyo and formerly called Nagamatsu. He took over the Osakaya business in 1770 at 24. Akita domain secretly planned to restore their economy by using “nanbanbuki” method, which was controlled by the government. Nanbanbuki was world’s “state-of-the-art” industry, which was to extract silver out of copper by means of lead. Initially Akita domain invited Hiraga Gennai as an advisor to try this method secretly, which resulted in failure. Consequently, in 1774, they sent Ohta Idaifu who was stationed at their Edo property, to Osakaya, to ask for their technical assistance. On August 3 of the same year, Ⅶ Kuzaemon Seihu dispatched seven of their technicians to Akita, including Zenuemon, a tedai(director) of Osakaya. Zenuemon searched through the domain and set up a “ginshiborisho”(copper smeltery) in Kagoyama, now called Futatsuicho, and their business turned out to be a success. This smeltery was later called “Kagoyama Seirenjo”(Kagoyama smeltery), and after its name being changed to Shinonome Seirenjo(Shinonome smeltery), it was eventually named Furukawa Mining Industry Company. Like Ⅵ Kuzaemon Chisyo, Ⅶ Kuzaemon Seihu was also appointed “dofukiya kumigashira”(representative of copper smelting industry), “Akitahan ondo sihaiyaku” (copper industry advisor) and “goyodofukiya”(merchant who was allowed by the government to smelt copper). He passed away on May 25, 1784, at 38. His wife, Shina, was a daughter of Sakabe Kantaro, the owner of Takatsuya. Served as the owner of Osakaya for 39 years from 1784 till 1833, aged 11-50. Born in 1774, and formerly called Eizo. He took over the Osakaya business in 1784 at 11. Osakaya’s copper smelting business in Akita Kagoyama was successful and they resumed copper smelting business in Osaka as well which had been lagging behind during Seihu’s tenure. In 1804, Osakaya expanded capacity at their Kagoyama copper smeltery to boost productivity. Consequently they posted a huge profit. Ani dozan (copper mine)business, whose management had been shifted from Osakaya to Akita domain, was declining, so Akita domain disparately asked Osakaya to take up its management again. In 1804, Ⅷ Kuzaemon Kenkyo dispatched Hikobee and Gihei, tedai(directors) of Osakaya, to Akita and had them manage local mines, such as Ani Ozawayama, Hachimori dozan(copper mine), Innai ginzan(silver mine), Fujikoto enzan(lead mine), etc. According to the record, Akita domain offered Hikobee a post as upper class samurai and salary of 50 koku in return. In 1810, Akita domain confiscated Osakaya’s rights to manage Kagoyama copper smeltery for their direct control. Ⅷ Kuzaemon Kenkyo was appointed “bakufukaisentoshiyorigoyaku” (shipping councilor for the government) and “Akitahan ondo sihaiyaku”(copper industry advisor for Akita domain)in addition to “goyodofukiya”(merchant who was allowed by the government to smelt copper). In 1833, Ⅷ Kuzaemon Kenkyo retired from business at 60, and passed the control of business to Sajiro, his second son. His eldest son Kumataro died young, and his third son Takematsu, later known as Yuzaburo Kensin, took over Osakaya’s branch family title. He passed away on Oct 20, 1850 at 77. His wife, Taka, was a daughter of Ichikawa Denzo, the owner of Nunoya. 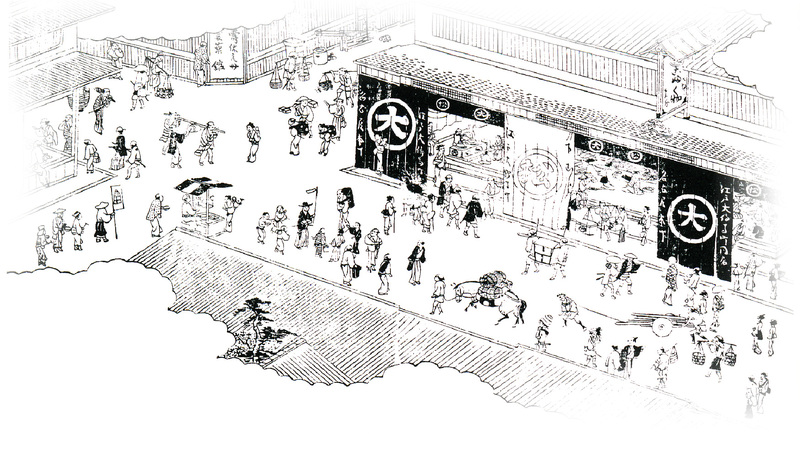 Served as the owner of Osakaya for 34 years from 1833 till 1867, aged 18-52. Born in 1816 as the second son of Ⅷ Kuzaemon Kensyo and formerly called Sajiro. He took over the Osakaya business in 1833 at 18. 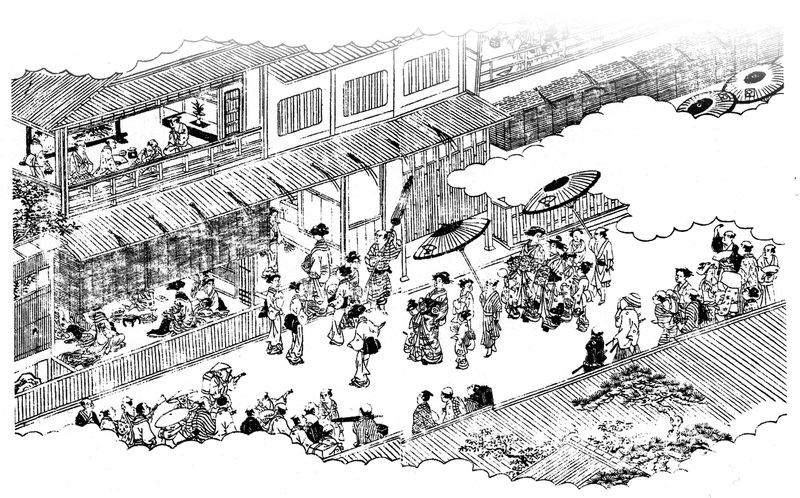 Towards the end of the Edo period, the government was losing its control and economy was stagnant. Initially there were 16 bakufugoyo dobukisho(merchants who were allowed by the government to do copper business), also known as “jurokunin kabunakama”, but the number was decreased to 8, including Sumitomo and Osakaya. In addition to their main business, Osakaya was also engaged in the sale and leasing of various properties. According to the record dated 1681, Osakaya owned 7 properties in Sumiyacho. Also, the record says that IX Komataro Seiken additionally made a purchase of property in Tachibanatori (Tachibana Street) 2-chome during Kaei period(1848-1854). IX Komataro Seiken was appointed “Bakufu kaisen toshiyori onyaku”(shipping councilor for the government) and “Akitahangodoshihaiyaku” (copper industry advisor for Akita domain) along with “bakufu goyo dofukiya”(merchant who was allowed by the government to smelt copper). Tokugawa Yoshinobu restored the Imperial Rule on Oct 14, 1867, and on December 20 of the same year, IX Komataro Seiken passed away at 52. Osakaya, which had been serving for the government for more than 200 years, withdrew from all their businesses, when the Tokugawa government was dissolved. His wife Nao passed away on March 11, 1895 at 60. Osakaya family line reached Kannami Tatsuo, the 14th in succession from the founder Kuzaemon. Komataro Seiken was Kannami’s great-great- grandfather. A liner entering the mouth of Ajigawa river.